Tangled Yoke Cardigan by Eunny Jang, Interweave Knits Fall 2007, Rowan Felted Tweed. The experience of knitting this sweater boggled my mind. 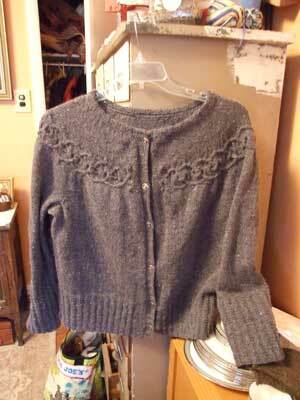 I knit this on #5s, which is the smallest size needle I've used for an adult sweater. It had crazy, mind-consuming stuff going on all the time. And yet this seemed like the quickest knit sweater I've ever done. What's up with that?? I made the body and the sleeves 2" longer than the pattern called for and that was just right. I sewed the collar down instead of doing the fussy 3-needle bind-off, I picked up 110 stitches for the button band instead of the 148 that the pattern called for (where would I have found those extra 38 stitches???? ); I made 6 k2og/yo buttonholes instead of the 9 bind-off/cast-on buttonholes that the pattern called for. I usually never block sweaters when I'm done, but this one needed it. I steam-ironed DIRECTLY on the sweater and it responded beautifully. This experience also reinforced my love for the Tangled Web Knit-Along. Usually I've knit the project ahead of time as a sample, but this time I knit along with everyone else. And the advice I got and the camaraderie of the other folks was really wonderful. It would have been much sloggier going without my fellow Knit-Alongers. As part of my Journey To The Center of the Core Of The Stash, I started the Mariannas Pullover in some old old old Jaeger Chamonix that I had bought at the Tangled Web on sale many years ago. [I'm too lazy to get up and take a picture, but will in the next day or so. It's aat a boring-looking point right now anyway....] Interestingly, because blue is not one of my favorite colors, the Chamonix, like the Felted Tweed I used in the Tangled Yoke Cardigan, is a steely grey-blue. So two blue sweaters in a row. The Chamonix is yummy - thick and soft - I'm glad that I made the Journey. I watched "Master and Commander" on hulu.com yesterday. I was avoiding it because I thought it might give away something about the books, but I decided I was far enough along to risk it. And I really wanted to see the ships and the rigging and the cannons and everything on screen. It was great - Russell Crowe was a great Jack Aubrey; Paul Bettany (though a great-looking guy in real life) made a creditable showing as the scrawny, plain Stephen Maturin. I highly recommend. I forgot to take the spring flag down and the Phillies won anyway. Now I'm stymied. Matthew said that I should let the flags work their mojo over a few days and not immediately take them up or down. I guess he's right. We'll see how they do today. Imagine my surprise when you said that was a blue sweater! I was just wondering why everyone is knitting with brown all of a sudden. My monitor is an evil liar, it seems. I've suspected as much. . . I thought it looked brown, too. By the way, you didn't happen to talk baseball with your dentist, did you? Just because he has season tickets to the Phillies and all. I guess he too figures this is Pat Burrell's MVP year - after his slugfest in Cincinnati yesterday. Russell Crowe as Jack Aubrey, eh? Well, I guess you wouldn't expect Charlton Heston. And I guess Jimmy Stewart was a little too aw-shucksy for the part. Anyway, I'm glad you enjoyed it. And you can tell your "word verification" people that their "v" looks like a "u." Bah, humbug! dk - I don't think it's totally your monitor - I think I must have had the camera on the "Antique Sepia Setting"! gg -I did happen to talk to my dentist about baseball! The hygeinist told me they actually schedule a half-hour of blank time after my appointments because they know how much he likes to talk baseball. He had some interesting theories about the Phillies infield of the future. Don't you mean, "Bah, hvmbvg"? I've seen the sweater in person, it's blue, really. I'm thinking about the May knit-along, never tried entrelac before. Why is gvs's grandad so grvmpy? Wa ha ha!! bb - you MUST do the entrelac knit-along!!! It is SO fun! I guarantee it! cg - don't start with gvs! you'll make my brain hurt! or hvrt.